In a 109-page report published at a new website CampaignFundingRisks.com, the Government Accountability Institute alleges the current online campaign contribution system lacks accountability and transparency, making it highly susceptible to foreign and fraudulent gifts. To read the full ABC News story, click here. Veteran Newsweek reporter Peter Boyer and GAI President Peter Schweizer report on the giant gap in our campaign-finance system that makes foreign and fraudulent donations possible. Click here to read the Daily Beast article. An investigation by the Government Accountability Institute revealed that JP Morgan has made at least $560,492,596 since 2004 from processing Electronic Benefit Transfer (EBT) cards for the food stamp program. Click here to read GAI President Peter Schweizer’s feature article on the Daily Beast. Governor Mitt Romney has refused to reveal the names of his campaign bundlers. But an investigation by the Government Accountability Institute uncovered the names of 34 of Gov. Romney’s top fundraisers. Find out more by visiting the interactive feature here on the Daily Beast. The Daily Caller ran a headline article covering the new report from the Government Accountability Institute on cronyism at the Department of Justice. The article was featured on the Drudge Report. Read the Daily Caller article here. The Justice Department’s decision not to prosecute Goldman Sachs in a financial-fraud probe is another sign of the cronyism that has kept Attorney General Eric Holder from taking action against other big Wall Street firms, says Government Accountability Institute President Peter Schweizer. Read the full article at the Daily Beast. The pressure on Romney to release his tax returns continues to mount. But he is also failing to disclose all of his bundlers. 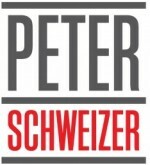 Peter Schweizer on what the public is missing. Read the rest at Daily Beast. In a Washington Times feature article today, Government Accountability Institute President Peter Schweizer reveals several heretofore unreported conflicts of interest between the Department of Justice, MF Global, and Jon Corzine. Read it here.